When Zorro was just a young leopard, he had his paws cruelly declawed. So when his owner, a Las Vegas entertainer, turned him over to Forever Wild Exotic Animal Sanctuary in 2007, he was at risk of a lifetime of pain from the unnatural procedure. Fortunately, he was able to undergo a restorative surgery that ensured he could live a life without pain. But his story's an important reminder of the dark practice that often haunts performing or "pet" big cats. Susan Bass, PR director for the Florida sanctuary Big Cat Rescue (BCR) - which is not affiliated with Forever Wild - told The Dodo that her group often sees cats come in with declawed paws. "It's just as painful for the big cats as it is for domestic cats," she said. "You take the first piece of ... their actual bones." But it can be even worse for big cats, because it's often a black market procedure. "What's sad about big cats especially is that a lot of times it's done without anesthesia or a trained veterinarian, when they're small cubs," she said. Their sellers can then market them as pets or performers who will bond with their owners and can't hurt them - teeth aside. This can lead to lifelong complications. One cougar at BCR was declawed as a kitten, and though she's now around 20 years old, her claws keep trying to grow back under the skin. "It's painful to walk on," Bass explained. "It can hamper their activity, and it can be painful for them to jump and land down on those paws." Fortunately, it looks like Zorro is now pain-free - and putting his paws to good use. 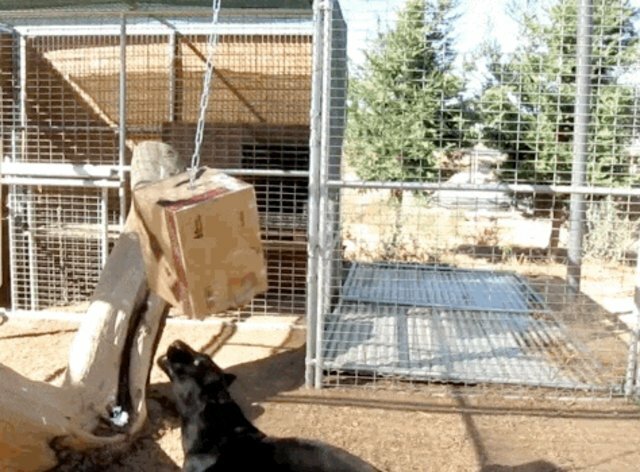 A video posted a few years ago shows the spry cat attacking a hanging box - and he totally goes to town. Seeing how powerful these cats are makes it that much sadder that so many of them are kept in captivity, often trapped in abusive or neglectful homes and forever cut off from their natural behaviors. To help support the few who make it to a sanctuary, you can donate to rescues like Forever Wild and BCR.